Marie M. Orta was born May 25, 1941 in Donie, Texas. She gained her wings on January 24, 2018. Visitation will be on Monday, January 29 from 6pm - 8 pm at OakCrest Funeral Home with a Rosary service at 6 pm. A Mass of Christian Burial will be at 11 am, Tuesday, January 30 at Sacred Heart Catholic Church with Rev. Benjamin Magnaye officiating. Burial will follow at Oakwood Cemetery. Marie was preceded in death by her parents; three brothers; a sister; daughter; and two grandsons. 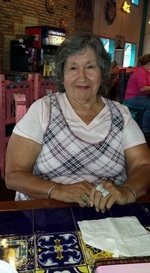 She leaves behind daughters, Mary Lou and husband, Noel Zuniga, Maggie and husband, Sebastian Aguilar; sons, Daniel Soto, and Silberio Jr. and wife, Elaine Soto; nine grandchildren; 12 great-grandchildren; brother, Jose and wife, Janie Martinez; and sister, Mary Lou and husband, Jesse Guajardo. Pallbearers will be Christopher Zuniga, Noel Zuniga, Jr., Alex Hernandez, Francisco Valdez, David Gonzales, Jesse Guajardo, Jr. and Austin Zuniga. Honorary pallbearers are Deandrea Lewis, Christopher Zuniga, Jr., and Alex Hernandez, Jr.
To send flowers to the family of Marie M. Orta (Martinez), please visit our Heartfelt Sympathies Store.